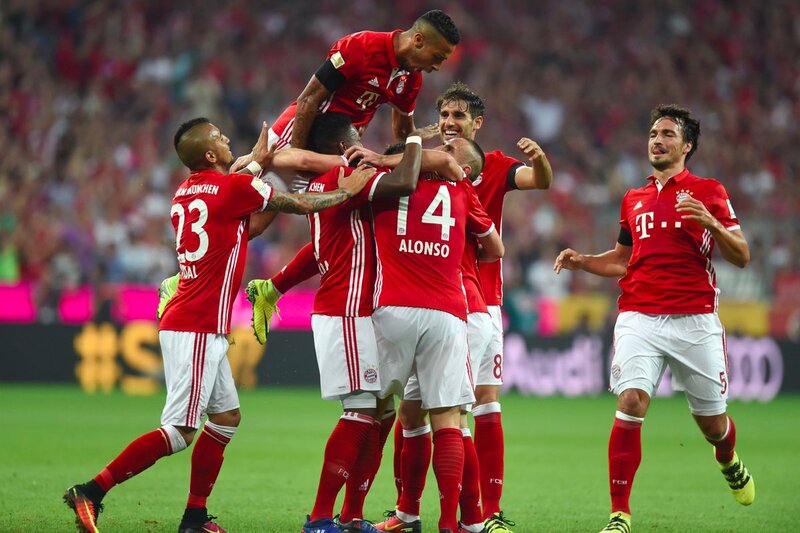 Carlo Ancelotti won his first Bundesliga game as Bayern Munich manager against Werder Bremen as the German champions throttled half a dozen goals past the helpless Felix Wiedwald in a brutal annihilation. In typical Bayern fashion, Ancelotti's men hogged the ball for much of the game, and weren't giving their visitors any time to settle into the rocking Allianz atmosphere. Thomas Muller fashioned a chance after eight minutes, as his drive deflected wide for a corner. From the set-piece the hosts took the lead in exceptional style. The ball ballooned up in the air outside of the box; Xabi Alonso connected sweetly with a well-timed volley to rocket in from 25 yards. a truly astonishing goal to get the German season underway. A goal down, and the Bremen floodgates gave way instantly. A cute through pass from Franck Ribery sent Robert Lewandowski scampering away, and the Polish target man squeezed the ball in from a tight angle - 2-0 up and cruise control for the reigning, defending champions. The party was underway in Bavaria, not even 25 minutes into the encounter and Bremen looked a bruised, battered outfit who just wanted to go home. Carlo Ancelotti was looking a relaxed man; Confident and anticipating a routine win with his new club. Just after the half an hour mark, Lewandowski should have doubled his tally from point-blank range. Thomas Muller arced an effort from distance at goal, but his shot cannoned off the post and into the stride of Lewandowski - the prolific Pole couldn't hold his nerve to make it 3-0 though, as his impromptu shot few into the stands. The Bayern exhibition of beautiful football continued before the half was over, Muller again carved out an opportunity and Lewandowski was there to pick up the pieces. This time though, the striker's attempt was thwarted by the legs of the overworked Wiedwald. Half time - Bremen would have thrown in the towel if they were afforded the option at this point. The second half was merely seconds old when Bremen lost possession. Bayern swarmed forward and Thomas Muller delivered a pin-point cross into the area for Robert Lewandowski to stab the ball over the line from close range. German national boss Joachim Low watched on in delight as several of his core stars impressed in a flawless performance. Mats Hummels looked right at home in the left centre back role, marshalling the defence in tandem with Javi Martinez, who deputised effectively for Jerome Boateng. 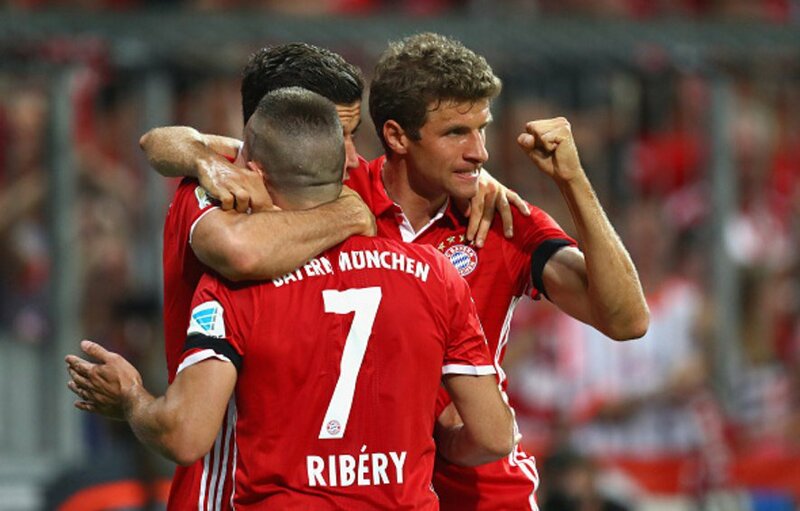 Muller was creator once again shortly after the hour, as a simple one-two launched Phillip Lahm into an advanced role and opened up space for the skipper to finish from an acute angle. The dynamic forward then racked up a hattrick of assists as Bayern tore through Bremen yet again, and his square cutback for Franck Ribery was met with a blasted finish through the crowd of clueless defenders. The fans had barely finished celebrating the goal before the referee pointed to the spot for a penalty after Thiago was shoved from behind, and Lewandowski finally completed hs hattrick with a cool spot kick evading the clutches of Wiedwald. To emphasise the pure dominance of the victory, Manuel Neuer had so little to do that the Bayern keeper had by now got the ball boys behind his goal to throw balls at him to keep him occupied. No injury time, the jury had spoken and the referee bestowed mercy upon Bremen, they had been victims of a thoroughly professional win by the country's most fearsome outfit. Ancelotti spells success wherever he has gone in the past, and the early indication from his philosphy sinking in at Bayern s that the Italian coach has fans dreaming of a first treble since 2013 under Jupp Heynckes. With the plethora of talent at their disposal, Bayern certainly look a formidable outfit and could be set to challenge seriously for the Champions League.